IS THIS THE SEAL OF THE PROPHET ISAIAH? The Hebrew University archeologist Dr Eilat Mazar has made what may be one of the most extraordinary finds ever made. In her excavations of the remains of the first Temple in Jerusalem, she has uncovered a bulla, or seal impression, which may have belonged to the prophet Isaiah. Her team discovered the bulla during renewed excavations at the Ophel, located at the foot of the southern wall of Temple Mount. 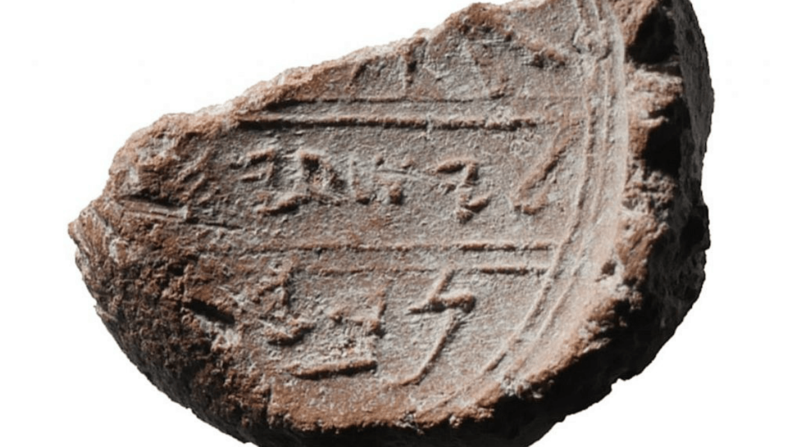 In an article published last week in Biblical Archaeology Review, entitled “Is This the Prophet Isaiah’s Signature?”, she describes the impression as inscribed with letters and what appears to be a grazing doe, “a motif of blessing and protection found in Judah, particularly in Jerusalem”. The legible letters in first Temple Hebrew spell out “Yesha’yah” and, on the line below, the partial word “nvy’. Yesha’yah(u) is Hebrew for Isaiah; with an additional letter aleph, “nvy” would correspond to the Hebrew word for prophet. In the absence of other letters, however, the question is whether the seal belonged to the prophet Isaiah or a different Isaiah altogether. Fascinating details of the relevant factors for consideration are laid out in this article in The Trumpet, the news magazine of the Philadelphia Church of God whose Herbert W Armstrong college in Oklahoma sends volunteers to help with the Temple excavations. The bulla was found only 10 feet away from where in 2009 Mazar’s team unearthed 34 bullae one of which, they discovered in 2015, bore the inscription “Belonging to Hezekiah, [son of] Ahaz, King of Judah.” Mazar, who has also uncovered King David’s palace, Solomon’s royal complex, Nehemiah’s wall and a golden medallion featuring a menorah from the seventh century CE, has described the Hezekiah bulla as the most important individual discovery of her career. From references in the Bible, it seems the prophet Isaiah was a close spiritual adviser to King Hezekiah. Some other scholars have questioned whether the Isaiah named on the bulla was the Isaiah. Dr Mazar herself is being scrupulously cautious, merely presenting the evidence and her own opinion of what it is most likely to signify. She asks, however, how likely it is that this bulla could belong to an Isaiah other than the Isaiah. The “chances of it belonging to any other but the known Prophet Isaiah”, Mazar told The Trumpet, “are extremely slim”. The sermon for February 25th is now available on the New Life web site. In this sermon, which is based on Romans 4:13-25, I talk about growing in faith. Jesus begins to tell His disciples that He will soon be rejected and crucified, but on the third day He will rise to life. Jesus then tells the crowd that if anyone wants to be a disciple they must die to themselves and take up their cross to follow Him. To win the world and lose your soul is tragic loss. The message is both scary and strangely appealing. Many christians fail to grow because they never settle in their heart that they have to die to themselves. The christian life is not just about asking Jesus into your heart even though it starts there. Being crucified is hard work, undignified, painful and deadly. It is everything that our fleshly nature revolts against. How are we to die to ourselves? 1. Decide daily TGIF- Today God Is First. I am no longer my own; I was bought at a price by Christ. I am literally His slave. 2. Sacrifice all ambition. The career ladder and professional advancement may not be what the Lord has for you. The nice house may not be in His plans either. 3. Humility. Our culture both hates and admires humility in others. We like leaders who have “the common touch” but are not too common themselves. I must always look at my life through Christ’s eyes not through the distorted lens of self-image. 4. Be a servant, totally dedicated to serving others and the Lord. Going out of my comfort zone to help others is good for my soul. Lord, you call me to take up my cross to follow you. I confess I find this call scary. I want to follow you in all things. Please help me to put to death all selfish ambition and to live entirely for you. Amen.